Be proactive with sharing your school’s story with the media and local legislators. Serving as an advocate for the charter public school movement is important to the future of public education. 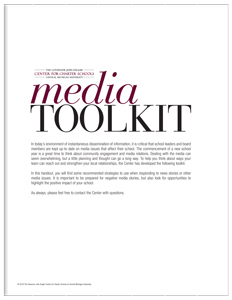 The Center’s Media Toolkit will help you think about ways your team can reach out and strengthen your school’s local relationships, as well as look for opportunities to highlight the positive impact of your school.